It is an interesting addition since it enriches our set of tools that characterize domains. The information might seem redundant or of little use for users intending to scan full URLs rather than domains, however, it is a very useful piece of information if you want to build scoring systems for URLs. 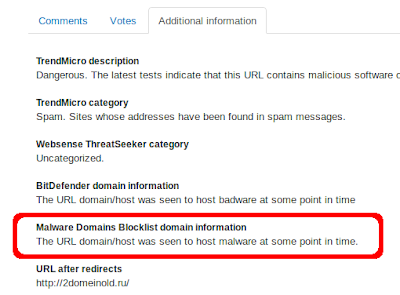 Even if the main URL scanners in VirusTotal do not detect the specific full path URL, you might want to produce your own intelligent system that receives several inputs, among them the results of domain datasets, and decides on the maliciousness of the URL. We are really grateful to www.malwaredomains.com, keep up the good work!